DataHub is an end-to-end data integration service. It collects and delivers your data to your exact specification. Our consultants implement and manage the proprietary DataHub software, leaving you to focus on using your consolidated data to maximum effect. Data is transmitted over the internet from the source to our data centre. It is then processed according to your requirements and securely transmitted to you or your suppliers. Data can also be managed to, from and within cloud services, such as the Google Cloud Platform, Microsoft Azure and Salesforce. DataHub can enhance your data to your agreed parameters, including data enrichment, data cleansing and data analytics. DataHub has our Transformation Manager software at its core. Transformation Manager implements mapping rules to ensure that the data is smoothly integrated and conforms to the quality levels and rules specified. It has been proven in hundreds of complex data integration situations worldwide. Find out more about Transformation Manager. DataHub not only leverages our proven software, but also our consultants’ extensive data management experience. 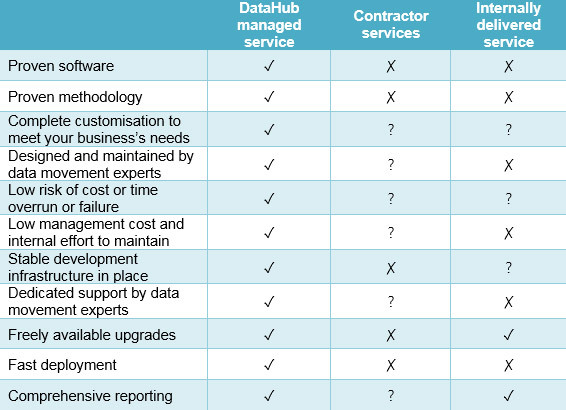 We manage DataHub on a daily basis to agreed service levels, with a named expert as your first point of contact. See the rationale and more details here.